Oriental Trading provided some of these products for this post. Additional items were purchased out of pocket by A Bride On A Budget. I went up north for a wedding two weekends ago, and of course, I was an out of town guest (well, my parents were the out of town guests and I was the person too cheap to pay for a room for myself so I crashed in their extra bed). When they checked in, they were handed a welcome bag (I used to always call them hotel bags but someone said welcome bag during a recent #BridalBabble Twitter chat and I liked that). Actually, the entire #BridalBabble was about welcome bags a few weeks back. We were chatting about what people like (and don't like). And then, when I was at the wedding earlier this month, I surveyed people there and asked what they did and didn't like. I took everyone's ideas and created these wedding welcome bags on a budget. There's a ton of stuff going on in that bag, so I'll walk you through it little by little. Start with the actual bag. When I asked, the overwhelming majority said that reusable was better than disposable (although the minority only said disposable because of the additional cost of reusable bags). I actually found a really great deal on Oriental Trading. You can get a 50-piece tote bag assortment for only $31.50. That's only $.63 a bag, which is actually less than I was finding disposable bags for. Reusable bags are great, especially in practicality. See, people are coming from out of town and every time I go out of town, I always end up coming home with more than I went there with. But I never end up with any extra bags. This is a great way to actually have that extra bag to pack your souvenirs in. I wanted to include post cards on the front of every bag, but they were a little out of my budget (I mean, they're 3/$1, which isn't terribly bad, but every penny counts -- especially when you're like me and have to make 100 bags). So what I did was design my own, then I printed them at Walgreens. You can use PicMonkey.com to edit your photos (I edited the coloring and more). Then, you can get great deals on prints (as low as free, which is when I got mine, but usually around 10 cents each on sale). When I asked people what they wanted most in bags, water and snacks was the best idea. I'm saving all my Walgreens points to get free water (more about that here). I was thinking about including one bottle per bag, but my mom said it should be at least two per bag. People are staying in the hotel room as a couple and you shouldn't expect them to share water. As far as snacks, I'm planning on using my Kmart points get bags of chips for the bags (although they're not pictured because it's a bit early to pick those up). I did, however, get some themed candy. 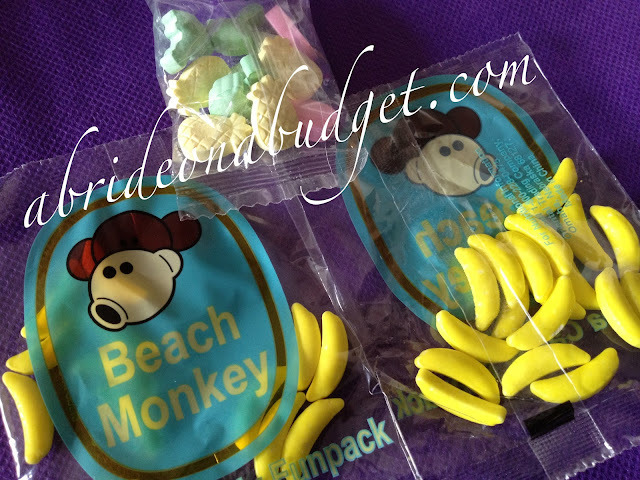 I picked up some beach monkey banana candy and tropical-shaped candy fun packs, both from Oriental Trading. Since we're having a beach wedding and everyone we know will be traveling to the beach, these were totally fitting. The banana candy is $7.25 for 48, so only $.15 each. The tropical candy is $4.99 for 57, so $.08. Add one to each bag and you're spending less than a quarter each. What I'm actually thinking is throwing these two candy packs along with a pack of gum into a mini organza bag. That way, the small candies won't get lost in the large tote bag. It's November now and it was 82 degrees last I checked. So imagine how hot it'll be for our June wedding. People will need fans. Maybe not at the wedding itself, but this bag is more for their time outside of the wedding. So I figured plastic fans would be great. If you can see, the purple fan in the middle is closed and the other two are open. This is something a woman can throw in her purse and pull out when she's sightseeing. The fans, you guessed it, are from Oriental Trading. You can pick plain fans, but I picked the hibiscus print fans. The're $3.50 a dozen, so $.29 each. The other items in the photo (the shampoo, hair spray, and razors), that's all recapped here. If you remember, that's all stuff I got for free after coupons. Our budget for the bags is $2 per bag. That's $200 total. I know, it seems crazy to think that we'll be able to make that budget ... until you actually recap. 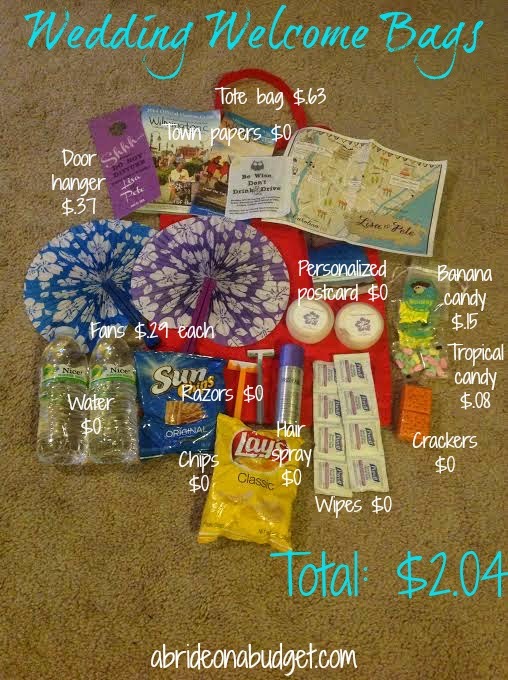 Ideally, I'm going to add chips to this (but that'll be less than $.85 for two bags) as well as area maps and information. I can get the maps and info free at the chamber (I've already asked and they will give me 100 of each, for free ... and more if I need it). So my $2 per bag budget is completely possible. And that bag is awesome and looks like it's more than $2. You just have to know how to spend your money. BRIDAL BABBLE: What else do you think this wedding welcome bag needs? Want to see our finished wedding welcome bags? 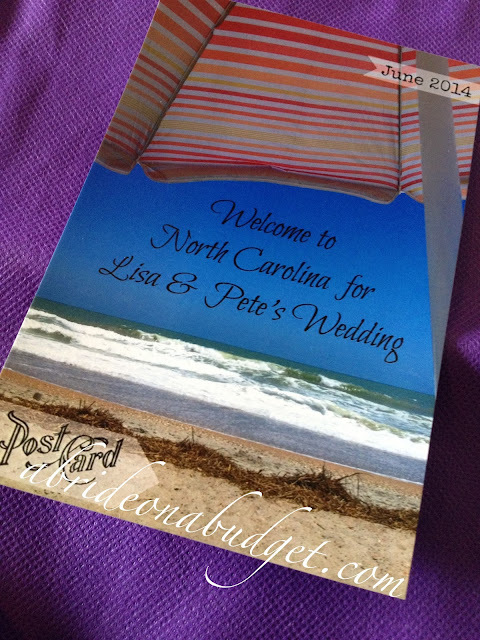 Check out our final wedding welcome bags post. Note: This post was written in 2013. Prices may have changed. A Bride On A Budget is not responsible for price changes. I love your bags! And how inexpensively you were able to put them together. It would be super if you could find someone to give you some sunscreen samples! I love your welcome bags, very thoughtful! 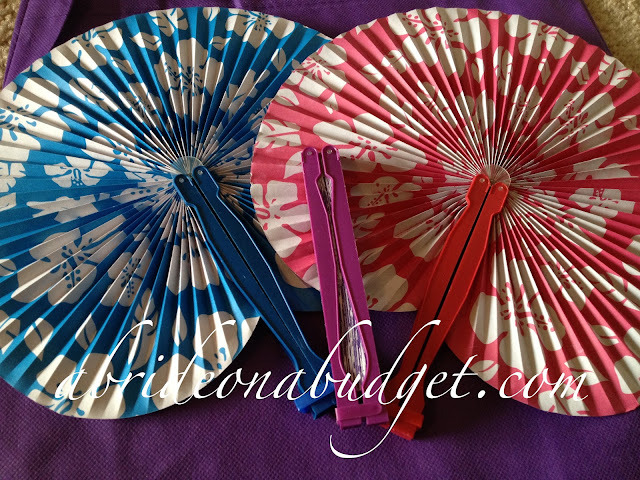 My favorite piece are the hibiscus print fans! So cute! Love the idea! Super cute!! great article and very good valuable content. i'm also one of the big fan of using reusable bags.